Stunning beaded keyring, featuring a mixture of glass beads and Bali-style spacers, with three chillis hanging from the bottom. These have a drop of approx. 15cm (not including the split ring for key attachment). 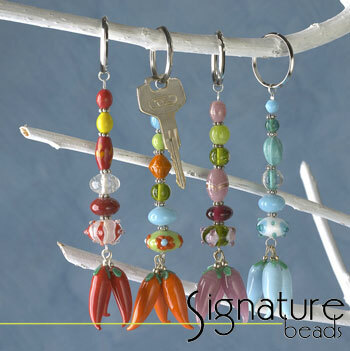 Each keyring is individually crafted, and therefore unique, and may differ slightly from the picture.